I'm curious about these 7's! I don't see any obvious relationship between the numeral 7 (or the word seofon) and the word and, and the book unfortunately doesn't elaborate. Do we know how this convention came about? If so, how? Was it really the numeral 7 or just a similar-looking symbol? The "et -> &" (ampersand) had no such shady character associations and continues to today. In fact, it allowed for some ornamental experimentation on the part of scribes and typemakers. The Tironian et died everywhere except for in Ireland, where it still lives in the wild. It is not used as a period, but as and, which is often how sentences were related them to a previous sentence in early narrative. You can see the periods (or "points")ending your sentences before the and. There was, however, a dearth of punctuation in many manuscripts. Notable exceptions were apostrophes, "C" for chapter, and "¶" used to mark paragraph divisions. In your example, there are end points (though not at baseline). Even though it looks like a seven, it's actually a shorthand character called a "Tironian et"
The Arabic/Indian numerals are most unlikely to have been known in England in the 12th century, so you can rule out the derivation of this symbol from the number 7. By the way, the Peterborough Chronicle is not in Old English, but Early Middle English. Not the answer you're looking for? Browse other questions tagged orthography writing typography old-english symbols or ask your own question. Did the Tironian “et” (“⁊”) have any impact on the ampersand being shift + 7 on English keyboards? & What is the story behind the Ampersand? 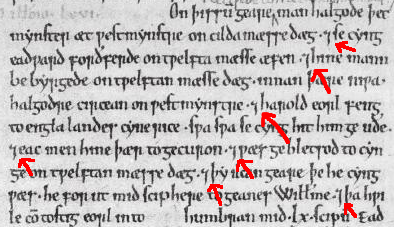 What did Old English writing (letters and formatting) typically look like?